Wallace traveled to California in February 1997 to promote his upcoming album and record a music video for its lead single, "Hypnotize". On March 5, 1997 Wallace gave a radio interview with The Dog House on KYLD in San Francisco, California. In the interview he stated that he had hired security since he feared for his safety, but this was because he was a celebrity figure, not specifically a rapper. Life After Death was scheduled for release on March 25, 1997. On March 8, 1997, he presented an award to Toni Braxton at the 11th Annual Soul Train Music Awards in Los Angeles and was booed by some of the audience. After the ceremony, Wallace attended an after party hosted by Vibe magazine and Qwest Records at the Petersen Automotive Museum in Los Angeles. Other guests included Faith Evans, Aaliyah, Sean "Diddy" Combs and members of the Bloods and Crips gangs. On March 9, 1997, at around 12:30 a.m., Wallace left with his entourage in two GMC Suburbans to return to his hotel after the Fire Department closed the party early due to overcrowding. Wallace traveled in the front passenger seat alongside his associates, Damion "D-Roc" Butler, Junior M.A.F.I.A. member Lil' Cease and driver, Gregory "G-Money" Young. Combs traveled in the other vehicle with three bodyguards. The two trucks were trailed by a Chevrolet Blazer carrying Bad Boy's director of security. By 12:45 a.m. the streets were crowded with people leaving the event. Wallace's truck stopped at a red light 50 yards (46 m) from the museum. A black Chevy Impala pulled up alongside Wallace's truck. The driver of the Impala, an African American male dressed in a blue suit and bow tie, rolled down his window, drew a 9 mm blue-steel pistol and fired at the GMC Suburban; four bullets hit Wallace in the chest. 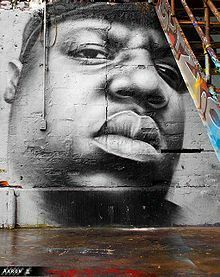 Wallace was rushed to Cedars-Sinai Medical Center by his entourage but was pronounced dead at 1:15 a.m.
Christopher George Latore Wallace (May 21, 1972 – March 9, 1997), popularly known as Biggie Smalls (after a fictional gangster in the 1975 film Let's Do It Again), Frank White (based on a fictional drug baron from the 1990 film King of New York), and by his primary stage name The Notorious B.I.G., was an American rapper.